accompanied by the Bristol Ensemble. 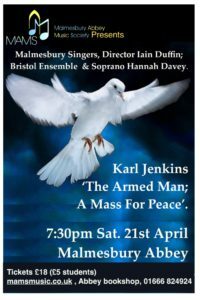 A dramatic and moving concert of The Armed Man, a Mass by popular composer Karl Jenkins, took place On Saturday 21st April in Malmesbury Abbey, to mark the centenary of the end of the First World War. 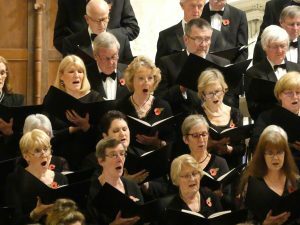 Malmesbury Singers performed to a sell-out audience who packed the Abbey for an electric night of music. A thunderstorm raging outside the ancient building added to the musical atmosphere of battle created inside by the percussion and instrumentalists of The Bristol Ensemble orchestra. The music was interspersed with readings of war poems by local actors Jacqueline Tong, Nikki Kelly and Anthony Smee. For more information please contact us using the tab above! Malmesbury Singers shared a Page. What a performance on Saturday night! An engaged and exciting context for the drama unfolding between the main characters… We were privileged to have soloists of such calibre and an Evangelist of real stature in Neil Jenkins. Follow Sam on Facebook, Soundcloud, Instagram and Twitter.